Evelyn M. Thomson, BSDH, MS, served 20 years as educator at Old Dominion University's Gene W. Hirschfeld School of Dental Hygiene in Norfolk, Virginia, receiving awards for Faculty Excellence; Continuing Education Teaching & Leadership; Outstanding Author; and Distinguished Alumni. In addition to teaching in the undergraduate dental hygiene program and mentoring graduate students in the master’s degree program, Thomson developed and taught numerous continuing professional education courses; served as a consultant to the Virginia Board of Dentistry; and conducted seminars for the American Dental Hygienists’ Association. Thomson’s expertise has been validated by membership in the American Academy of Oral and Maxillofacial Radiology, and with an appointment on the National Board Dental Hygiene II Test Construction Committee by the Joint Commission on National Dental Examinations. 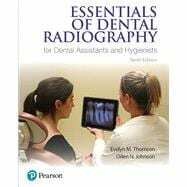 Thomson is author and co-author of three textbooks: Exercises in Oral Radiographic Techniques: A Laboratory Manual; Case Studies in Dental Hygiene; Essentials of Dental Radiography for Dental Assistants and Hygienists, and has published numerous manuscripts in peer-reviewed dental hygiene journals. Evie lives at the Virginia Beach oceanfront with her husband Hu Odom.